The X Marks the Spot is an X, with the Scatter, Gather, Matter process running horizontally through the middle of it. From left to right are the six psychological stages of engagement, from acknowledge, up to enlist. 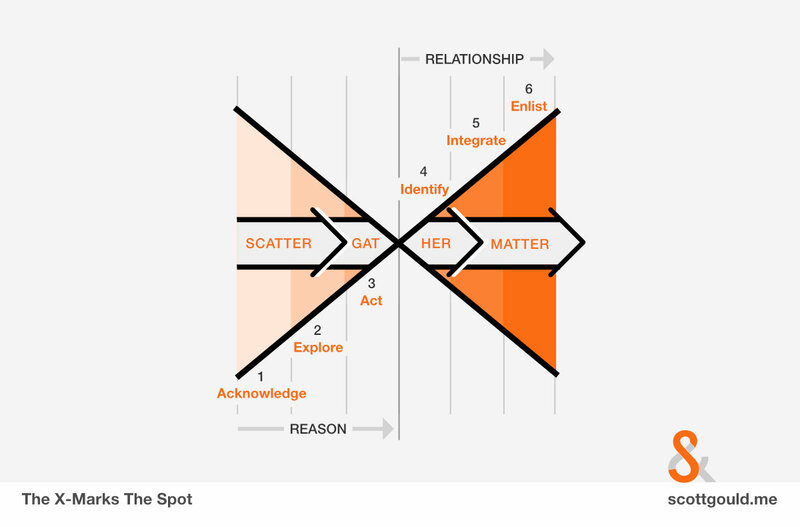 There are two stages to each of the three Scatter, Gather, Matter processes. Acknowledge. Your users are mentally aware of you, and also know that you wish to engage them, or at least people like them. They understand what engagement would look like with your product. They are most likely at this level because someone told them about your product, or they saw it shared on social media. This could be evidenced by visits to your website, people on a mailing list, or followers on social media. Explore. Your users are discovering more about you, such as checking out functionality on your website, and possible by signing up for your product, but without necessarily using it much. At this level they are seeing if your product is for them. This might be longer visits on a website, interaction with content on social, or even downloads of your product. Act. If you users haven’t signed up to your product yet, they definitely have by now. It is on their device, they are physically engaging it, and performing the core action. They may well keep using it if there isn’t anything better for them. But you have not yet passed the “home screen” test. Many users get stuck here, just lightly using something without committing to it, like many novelty apps or play-and-then-delete games. Typical measurements revolve around a core action. Identify. At some point, both the value the product provides, as well as the values by which it provides the benefit (ie. the brand values), are such that the user begins as identifying with the product. They may something like “I love X” or “I’m a Y-er” or “I’m a Z-user”. Look at anyone with a Reddit or similar sticker on their laptop, and you see the identity level. This requires ascertaining what someone who identifies with you does that someone who does not will not do, such as a certain volume of usage, or a particular action. Integrate. Having identified with the product, the user commits to it and makes it a part of their daily life. This is marked by regular, exclusive usage (no one uses a competitor at this level), such as deciding to be with the iCloud ecosystem or the Google ecosystem. At this point, the user would suffer without your product. It’s similar to the concept of being “married to the brand”. Like level 4, this will usually be measured by volume, particularly around daily usage. Enlist. The user adopts the same end goal as you, and subscribe to your purpose,, such that they want to drive it forward with you. WordPress contributors live here. They have enlisted in your mission. You don’t get more engaged than this. The analogy in human relationship is when two adults decide to “enlist” in each other and have a child. With users this could be measured with contributive KPIs, such as commits to a github. The left side of the X is where the Scatter process happens. This is a place of high volume, low value, just like we’d expect considering that this process is about scattering a message, encouraging other to spread the message, and embracing the role of chance throughout all of it. The right side of the X is, by contrast, a place of low volume, high value, also what we expect when talking about mattering through means and meaning: two high value things that in general we expect less of our people to connect with. In the middle of the X – where X marks the spot! – we have the shared moment that we have talked so much about, which is the hallmark of the Gather process, and the very thing that its offering, Engagement as Experience, provides. Unless the receiver of our engagement becomes a responder, and gathers around our offering, they cannot go on to become a cooperator with us and be enabled the platform that we provide. Thus, the Gather process is not just another part of engagement, but the doorway from low value to high value connection, for both the receiver and the initiator. This marks the transition from engagement being based on reason to being based on relationship.